Benzo(α)pyrene (BaP) possesses a forceful hepatotoxicity, and is ubiquitous in foods and ambient air. Our previous study found that BaP induced pyroptotic and autophagic death in HL-7702 human liver cells; the relevant mechanisms, however, remain unknown. This work was therefore to unravel the effects of the PI3K/Akt signaling pathway on pyroptotic and autophagic death triggered by BaP. Cells were treated with or without LY294002 (PI3K/Akt inhibitor) and IGF-1 (PI3K/Akt activator) before BaP exposure, and the results showed that compared with the control, the protein expression of p-Akt was markedly decreased by BaP (p < 0.05). IGF-1 did not subvert this inhibitive effect of BaP, while LY294002 enhanced it. 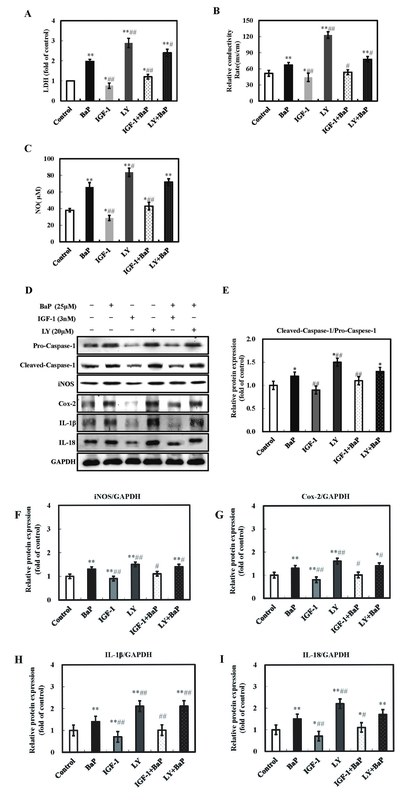 Furthermore, the protein expression of pyroptosis (Cleaved Caspase-1, NO, IL-1β, IL-18), as well as LDH and the relative electrical conductivity were significantly augmented by BaP. The levels of these indices were increased by LY294002 pretreatment, and decreased by IGF-1. Similarly, LY294002 enhanced BaP-induced increase in the key protein expression of autophagy (Beclin-1 and LC3II), while IGF-1 weakened it. Finally, the phosphorylation of FOXO4 was clearly (p < 0.01) inhibited by BaP, and LY294002 suppressed this inhibitive effect of BaP, while IGF-1 strengthened it. In conclusion, BaP was able to induce pyroptotic and autophagic death via blocking the PI3K/Akt signaling pathway in HL-7702 liver cells. Benzo(α)pyrene (BaP), a major compound of the polycyclic aromatic hydrocarbon family (PAH), is recognized as a potent carcinogen with forceful immunotoxicity and reproduction toxicity (Yuan et al., 2017). It is ubiquitous in foods and ambient air, as a result of incomplete combustion of carbon compounds (Rangi et al., 2018). BaP is found in oils and fatty foods which are charcoal-broiled, grilled, baked, or smoked with these oils (Kazerouni et al., 2001; Lewtas, 2007). It was reported that the content of BaP in burnt foods is 20 times more than that in general food (Clements et al., 1994). It is also extensively present in sediment (Khalid et al., 2017), soil, tobacco smoke, contaminated water and some poorly cleaned raw products. Additionally, particulate matter with an aerodynamic diameter less than 2.5 μM has become one of the major environmental pollutants in cities and BaP is an important ingredient of it. Because of its small size and large surface area, BaP can be absorbed in the respiratory system and consequently induce inflammation and pulmonary injury (Zhang et al., 2017). The liver has a much higher ability to absorb and metabolize BaP than other organs (Mantey et al., 2014); thus, there are more toxic deposits in the liver. Nowadays, liver cancer caused by BaP is becoming more and more serious. As we know, because of the significant role in development, differentiation, cellular homeostasis, elimination of undesired and malignant cells, programmed cell death is a vital process of cells (Zhang et al., 2018). Autophagy and pyroptosis are two types of programmed cell death. 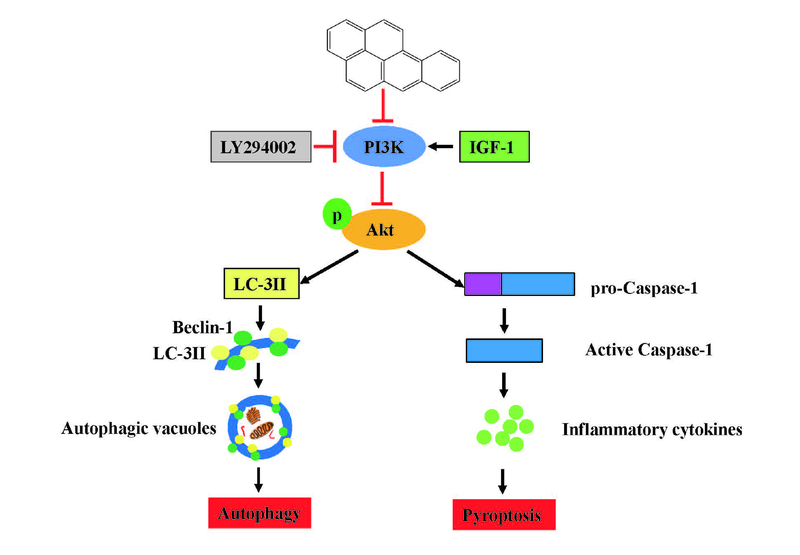 Pyroptosis uniquely relies on caspases-1 activation and inflammation (Yuan et al., 2017). In contrast to pyroptosis, autophagy regulates cell survival through removing long-lived proteins and damaged organelles. However, persistent and excessive autophagy leads to cell death (Swart et al., 2016). Previous studies unraveled that BaP promotes the release of pro-inflammatory cytokines and increases the protein expression of iNOS in mice colon (Ajayi et al., 2016), lungs (Shahid et al., 2016; Shahid et al., 2017), airway (Yangisawa et al., 2016), and intestine (Ribiere et al., 2016) and zebrafish embryos (Duan et al., 2016). That is to say, BaP triggers inflammation. In our previous study, we observed that BaP is able to damage liver cells through inducing autophagy and pyroptosis, while the underlying mechanism remains poorly understood. As a central mediator in signal transduction pathways regulating cell growth and metabolism, the PI3K/Akt signaling pathway plays an important role in cell survival. Previous studies showed that activation of the PI3K/Akt signaling pathway suppresses autophagy, which might be devoted to the protection of mammalian cells, thus combating various damaging diseases (Liu et al., 2018). Another study found that H2S is able to inhibit autophagy in the treatment of myocardial fibrosis by activating the PI3K/Akt signaling pathway (Xiao et al., 2016). So far, there are many projects concerning the relationship between the PI3K/Akt signaling pathway and autophagy, but hardly any concerning the effect of the PI3K/Akt signaling pathway on pyroptosis. In the present study, we investigated the effect of BaP on the P13K/Akt signaling pathway, and explored whether BaP induces pyroptosis and autophagy through the PI3K/Akt signaling pathway in HL-7702 liver cells. Benzo[a]pyrene (BaP, ≥ 96%), MTT, dimethylsulfoxide (DMSO), trypan blue, and monodansyl cadaverine (MDC) were obtained from Sigma (St. Louis, MO, USA). Insulin-like growth factor-1 (IGF-1) (100-11) was purchased from Pepro technology (Rocky Hill, CT, USA). LY294002 (S1737) and acridine orange (AO) were obtained from Beyotime Biotechnology company (Jiangsu, China). The RPMI-1640 medium and BCA protein kit were obtained from Thermo Fisher (Waltham, MA, USA). Polyclonal antibodies specific to Akt (AA326) and Phospho-Akt (Ser473) (AA329) were purchased from Beyotime Biotechnology company. GAPDH (BA2913) was purchased from Boster Biological Technology Co. Ltd. (Valley Ave, Pleasanton, CA, USA). Pro-Caspase-1 (EPR16883) was obtained from Bioworld Technology, Inc. (Louis Park, MN, USA). Cleaved-Caspase-1 (4199), Cox-2 (4842), LC3A/B (4108), Beclin-1 (3738), Phospho-FOXO4 (Ser193) (9471) and FOXO4 (9472) were purchased from Cell Signaling Technology (Shanghai, China). IL-1β (16806-1-AP), IL-18 (SC-6179) and iNOS (SC-8310) were purchased from Santa Cruz Biotechnology (Santa Cruz, CA, USA). All other chemicals were produced in China and were of analytical grade. The human HL-7702 hepatocyte cells were purchased from the Type Culture Collection of the Chinese Academy of Sciences (Shanghai, China) and maintained in RPMI1640 containing 10% fetal bovine serum (FBS), 100 U/mL penicillin and 100 μg/mL streptomycin. Cells were incubated in a humidified incubator with 5% CO2 at 37°C. The viability of HL-7702 cells was measured by MTT methods. Briefly, HL-7702 cells were seeded in 96-well plates at a density of 1 × 106 cells/mL. After 12 hr, the medium was replaced by different treatments, including serum-free medium, 25 μM BaP, 3 nM IGF-1, 20 μM LY294002, 25 μM BaP plus 3 nM IGF-1 and 25 μM BaP plus 20 μM LY294002. After exposure for 24 hr, MTT solution was added to the plate (5 mg/mL) 20 μL/well, and incubated for 4 hr. Subsequently, the culture medium was replaced with 150 μL DMSO. The absorbance of each well at 490 nm was measured by a microplate reader (Thermo Fisher). Cell viability was expressed as a percentage of the control cells. Additionally, the cell mortality rate was analyzed by trypan blue exclusion assay (0.04%, 10 min) and observed using a fluorescence microscope (Olympus Optical Co., Ltd., Tokyo, Japan). After treatments, the culture supernatant liquid was collected and examined by conductivity meter (DDSJ-308A, Shanghai Precision Scientific Instrument Co., Ltd., China) and the tri-distilled is prepared to zero the conductivity meter. The level of LDH is used to indicate the cell membrane damage and cellular permeability. LDH in the culture supernatants was measured using an LDH kit (Nanjing Jianchen Bioengineering Institute, China). Briefly, at the end of the 24-hr incubation, 20 μL of culture supernatant of different treatment was taken out for activity analysis according to the manufacturer’s guidance. The absorbance was read at the wavelength of 450 nm and the results were expressed as the percentage of LDH leakage versus control cells. NO in culture supernatant liquid was measured by the Griess reagent (0.1%(w/v) N-(1-naphathyl)-ethylenediamine and 1%(w/v) sulfanilamide in 5% (v/v) phosphoric acid). Briefly, after incubation, the supernatant (centrifuged: 400 × g, 5 min) was mixed with 130 μL de-ionized water and 20 μL Griess reagent at 25°C for 15 min. Then, the absorbance was measured at 540 nm with an enzyme-labeled instrument (Thermo Fisher). The production of nitrite was calculated based on a sodium nitrites standard curve prepared in advance. The level of autophagy was determined by AO (1 μg/mL AO at 37°C for 15 min) and MDC (50 m/L MDC at 37°C for 1 hr) fluorescence staining, respectively. After staining, cells were observed using a fluorescence microscope (Olympus Optical Co., Ltd.). After treatment, cells were harvested and lysed for 20 min on ice in RIPA buffer, and then centrifuged at 15,000 g for 15 min at 4°C. The homogenates of protein were treated with SDS sample buffer at 100°C for 10 min. After the proteins were separated by SDS-PAGE and electrotransferred onto a polyvinylidene fluoride membrane (0.45 μm, Millipore). Then, membrane blocking with 5% nonfat dry milk for 1.5 hr. Subsequently, the primary antibodies were added overnight at 4°C, and secondary antibodies were incubated at 25°C for 2 hr. The blots were developed with chemiluminescent substrate and exposed using a Molecular Imager Chemidoc XRS System (UVP, Ltd., Upland, CA, USA). All experiments were performed three times, and the data are presented as the means ± standard errors (SE). Significant differences between measurements for the control and treated samples were analyzed using one-way factorial analysis of variance (ANOVA), followed by Duncan’s post-hoc test (SPSS 16.0). PI3K/Akt pathway plays an important role in the regulation of cell growth. To determine the effect of PI3K/Akt pathway in BaP-induced cytotoxicity, cells were pretreated with IGF-1 (a representative PI3K stimulator) and LY294002 (a representative PI3K inhibitor) for 30 min prior to the addition of BaP, respectively. As shown in Fig. 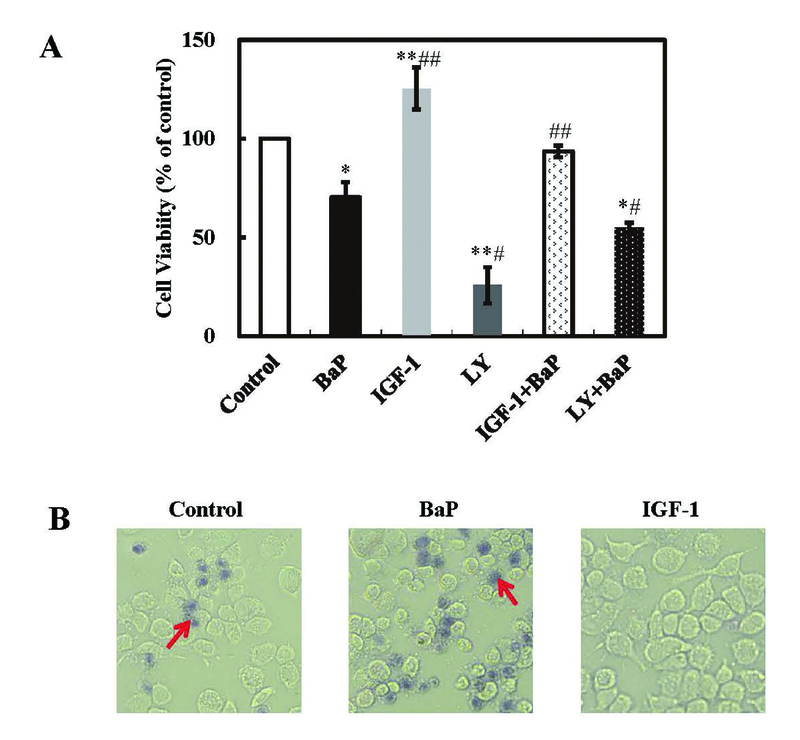 1A, IGF-1 markedly (p < 0.05) inhibited BaP-induced decrease in cell viability, while LY294002 significantly (p < 0.1) enhanced BaP-induced decrease in cell viability. Likewise, trypan blue staining assay also showed that a significant decrease in the number of dead cells in the IGF-1 plus BaP treatment group, and an increase in the number of dead cells was also observed in the group pretreated with LY294002 (Fig. 1B). These results suggest that BaP decreased cell viability via the PI3K/Akt signaling pathway. Effect of PI3K/Akt signaling pathway on cytotoxicity of HL-7702 cells induced by BaP. Cells were treated with BaP, IGF-1 (a PI3K/Akt activator), LY294002 (a PI3K/Akt inhibitor), IGF-1 plus BaP, LY294002 plus BaP for 24 hr, respectively. (A) MTT assay. The results are shown as the means ± SD of nine separate experiments. *p < 0.05 and **p < 0.01 versus control treatment, and #p < 0.05 and ##p < 0.01 BaP treatment. (B) Trypan blue staining, arrows indicate dead cells. As we know, p-Akt is the key factor of the PI3K/Akt signaling pathway. Activation of the PI3K/Akt signaling pathway increases the expression of p-Akt and consequently promotes cell growth. In order to analyze the effect of BaP on the PI3K/Akt signaling pathway, we measured the total and phosphorylated levels of Akt. As shown in Fig. 2, compared with the control, the levels of p-Akt were obviously (p < 0.05) reduced by 25 μM of BaP. To further verify the inhibitive effect of BaP on the PI3K/Akt signaling pathway, cells were treated with 20 μM LY294002 (a PI3K/Akt inhibitor) and 3 μM IGF-1 (a PI3K/Akt activator), respectively. p-Akt levels were clearly increased by IGF-1, and decreased by LY294002. Compared with the BaP group, pretreatment with IGF-1 could not subvert the inhibitive effect of BaP on the phosphorylation of Akt, and LY294002 could strengthen this inhibitive effect of BaP on the expression of p-Akt, while no significant differences were found between these two groups. And, the total Akt levels showed no significant changes throughout the study. In conclusion, BaP is able to block the PI3K/Akt signaling pathway. Effects of BaP on the PI3K/Akt signaling pathway of HL-7702 cells. Cells were treated with the PI3K/Akt signaling pathway activator (IGF-1, 3 nM) and inhibitor (LY294002, 20 µM) alone, or were treated 30 min before together with BaP (25 µM). After 24 hr, the protein expression of Akt and were assessed by western blot analysis. GAPDDH was used as internal control (A). The intensity of the ratio of p-Akt to Akt was quantified by densitometry analysis. *p < 0.05 and **p < 0.01 versus control treatment, and #p < 0.05 versus BaP treatment. The level of LDH is used to indicate the cell membrane damage and the cellular permeability. Pyroptosis leads to damage of cellular permeability. When pyroptosis occurs, cell membrane is destroyed and many inflammatory factors are released to extracellular, such as IL-1β and IL-18. Therefore, the release of LDH and NO, and the relative electrical conductivity are major indicators of pyroptosis. As shown in Fig. 3, the levels of LDH (Fig. 3A), NO (Fig. 3C) and relative electrical conductivity (Fig. 3B) were markedly increased (p < 0.01) in the cells incubated by BaP alone, compared with the control. And, the levels of these three factors were notably decreased in the IGF-1 plus BaP group (p < 0.01), while in the LY294002 plus BaP group, the levels of LDH and relative electrical conductivity were obviously increased (p < 0.05), though the level of NO had little change. Effect of PI3K/Akt signaling pathway on BaP-induced pyroptosis in HL-7702 cells. Cells were incubated with BaP, IGF-1 (a PI3K/Akt activator), LY294002 (a PI3K/Akt inhibitor), respectively, and were treated with IGF-1 and LY294002 30 min before together with BaP treatment. After 24 hr treatment, cells were exposed to AO and MDC, and were observed by ﬂuorescent microscopy. Arrows indicated the cells that containing autophagic vacuoles (A). LC3 and Beclin-1 were assessed by western blot analysis, GAPDH was used as an internal control (B). The intensity of the ratio of LC3 II to LC3 I (C) and Beclin-1 (D) were quantified by densitometry analysis. *p < 0.05 and *p < 0.01, compared with the control groups, and #p < 0.01 and ##p < 0.01 compared with the BaP groups. To thoroughly investigate whether BaP led to the pyroptotic cell death by inhibiting the PI3K/Akt signaling pathway, we measured the key indicative factor protein of pyroptosis and some inflammatory factors, such as pro-Caspase-1 (a precursor of Cleaved-Caspase-1), Cleaved-Caspase-1, iNOS, Cox-2, IL-1β and IL-18. Compared with the control, the ratio of Cleaved-Caspase-1 to pro-Caspase-1 was obviously increased by BaP treatment (p < 0.05). IGF-1 markedly (p < 0.01) decreased BaP-induced increase in the ratio of Cleaved-Caspase-1 to pro-Caspase-1, while no significant difference was found in cells pretreated by LY294002. As shown in Fig. 3D-I, compared with the control, there was increased expression of iNOS, Cox-2, IL-1β and IL-18 after BaP exposure. The expression of these proteins was decreased by pretreatment with IGF-1, and were increased by LY294002 plus BaP treatment. In a word, all the results suggest that BaP is able to induce pyroptosis, and a PI3K/Akt inhibitor, LY294002 could promote BaP-induced pyroptosis, and a PI3K/Akt activator IGF-1 could block BaP-induced pyroptosis, indicating that BaP induces pyroptotic death by blocking the PI3K/Akt signaling pathway, and subsequently results in cell membrane permeability damage and release of inflammatory factors. In this study, the specific fluorescent dyes AO and MDC were used to measure the quantity of autophagy vacuoles. As shown in Fig. 4A, compared with the control, there was substantial red fluorescence in the BaP groups marked with AO, indicating an increase in the quantity of autophagy vacuoles. Compared with the BaP group, a small amount of bit red fluorescence appeared in the group pretreated with IGF-1; however, there was more red fluorescence in the LY294002 plus BaP group. BaP also resulted in an increase in bright green fluorescence which is stained using MDC, indicating an increased formation of autophagy vacuoles. Compared with the BaP group, a small amount of green fluorescence was found in the IGF-1 plus BaP group, and much more green fluorescence was found after LY294002 plus BaP treatment. Effect of PI3K/Akt signaling pathway on BaP-induced autophagy in HL-7702 cells. Cells were exposed to BaP and the PI3K/Akt signaling pathway activator and inhibitor for 24 hr, and then culture supernatant and cell pellet were collected, respectively. The culture supernatant was used to access LDH release (A), the relative electrical conductivity (B) and NO (C). Cell pellet was lysed and total protein was harvested to examine the pyroptotic marker proteins (Pro-Caspase-1, Cleaved-Caspase-1, iNOS, Cox-2, IL-1β, IL-18) by western blot (D). The ratio of Cleaved-Caspase-1 to Pro-Caspase-1 (E), and the graph depicts quantitation of other the pyroptotic marker proteins contents (F). * p < 0.05 compared with the control, and ##p < 0.01 compared with the BaP groups. Additionally, compared with the control, the protein expression of Beclin-1 (Fig. 4B and D) and the ratio of LC3II to LC3I (Fig. 4B and C) were markedly (p < 0.01) increased by BaP. And, contrasted with the BaP group, the level of Beclin-1 and the ratio of LC3II to LC3I in cells pretreated with IGF-1 were notably decreased (p < 0.01), and the reverse results was found in the cells pretreated with LY294002. To sum up, all the results suggested that BaP is able to induce autophagic death through inhibiting the PI3K/Akt signaling pathway in HL-7702 cells. Furthermore, FOXO transcription factors are associated with several biological processes, such as the stress resistance, metabolism, cell cycle, apoptosis, and DNA repair. FOXO4 is one of the FOXO proteins in the FOXO subfamily. As a downstream effector, FOXO4 was phosphorylated by the PI3K/Akt signaling pathway via activating the downstream kinase Akt. The present result (Fig. 5) showed that the ratio of p-FOXO4 to FOXO4 was clearly (p < 0.01) decreased by BaP treatment, compared with the control. And, compared with the BaP group, the ratio of p-FOXO4 to FOXO4 in the BaP plus LY294002 group and the BaP plus IGF-1 group was notably decreased and increased, respectively (p < 0.01). In summary, BaP suppressed FOXO4 phosphorylation through inhibiting the PI3K/Akt signaling pathway. Effect of BaP and PI3K/Akt signaling pathway on FOXO4 phosphorylation in HL-7702 cells. Cells were treated with IGF-1 (a PI3K/Akt activator) or LY294002 (a PI3K/Akt inhibitor) 30 min prior to exposure to BaP for 24 hr. Then, cells were harvested in lysis buffer, and the protein expression of p-FOXO4 and FOXO4 were assessed by western blot analysis. GAPDH was used as internal control (A). The densitometric analysis shows the mean ± SD of four independent experiments. *p < 0.05 and **p < 0.01 versus control treatment, and #p < 0.05 and ##p < 0.01 compared with BaP treatment. BaP is acknowledged as a worldwide toxic carcinogen which is usually produced by incomplete combustion of carbon compounds in daily food processing. And, it is a major compound of air contaminants. Except for the alimentary canal, BaP can be absorbed into the airway and do harm to the respiratory system and other organs. It was reported that the liver is able to absorb and metabolize BaP much more than other organs (Mantey et al., 2014). Our previous research found that BaP led to injury in HL-7702 liver cells via inducing pyroptosis and autophagy, but the mechanism is not yet clear. In the present work, through studying the effect of BaP on the PI3K/Akt signaling pathway in HL-7702 liver cells, we found that BaP blocked the PI3K/Akt signaling pathway and caused cell death. To verify whether BaP induces pyroptotic and autophagic death through the PI3K/Akt signaling pathway, we treated cells with or without LY294002 (a PI3K/Akt inhibitor) and IGF-1 (a PI3K/Akt activator) before BaP exposure. Expression of key proteins and some particular indices of these two types of the programmed cell death were investigated, showing that BaP was able to induce pyroptotic and autophagic death by suppressing the PI3K/Akt signaling pathway in HL-7702 liver cells. Many previous studies reported that the PI3K/Akt signaling pathway is closely related to cell survival, it is a vital mediator in the process of cell growth and metabolism (Liu et al., 2018). Once the PI3K/Akt signaling pathway is inhibited, cells will die. Inflammation is a biological reaction that aims to remove harmful stimuli. As the main inflammation factors, NO, IL-1β, IL-6, etc. are overproduced during inflammation. However, high concentrations of these inflammation factors can result in inflammatory diseases and cause inflammatory cell death (Cheng et al., 2014). Pyroptosis is a type of inflammatory death; when it is induced, many inflammatory factors (such as NO, IL-6, IL-12, IL-1β and IL-18) are released to the extracellular space, and meanwhile the levels of relative electrical conductivity and LDH also increase. It was reported that lipopolysaccharides induce inflammation and promote the expression of inflammation factors (IL-1β and IL-6) through inhibiting the PI3K/Akt signaling pathway in raw 264.7 macrophages (Yang et al., 2018). Another study demonstrated that streptozotocin was capable of inducing testicular damage due to the sustained inflammation, and up-regulated the production of NO via inhibiting the PI3K/Akt signaling pathway (Mervat et al., 2018). Consistent with these conclusions, our results showed that BaP augmented the release of inflammation factors, including NO, iNOS, Cox-2, IL-1β and IL-18, and improved the activation of Caspase-1, which is a kind of characteristic protein of pyroptosis. Namely, BaP could consequently induce pyroptotic cell death via blocking the PI3K/Akt signaling pathway in HL-7702 liver cells (Fig. 3). Additionally, there have been many projects concerning the relationship between the PI3K/Akt signaling pathway and autophagy. A previous study affirmed that as the most toxic form of arsenic, arsenic trioxide (As2O3) inhibited the activation of the PI3K/Akt signaling pathway and promoted autophagy in chicken jejunum (Wang et al., 2018). And, aluminum-overload significantly down-regulated the PI3K/Akt signaling pathway, meanwhile activated autophagy (Hu et al., 2018). In our research, we used the specific fluorescent dyes AO and MDC to measure the quantity of autophagy vacuoles in cells treated with or without LY294002 and IGF-1 before BaP exposure. The result was that BaP increased autophagy vacuoles visibly, and an acceleration was observed in the LY294002 pretreatment group, while a decrease in the pretreatment with IGF-1 was noticed (Fig. 4A). 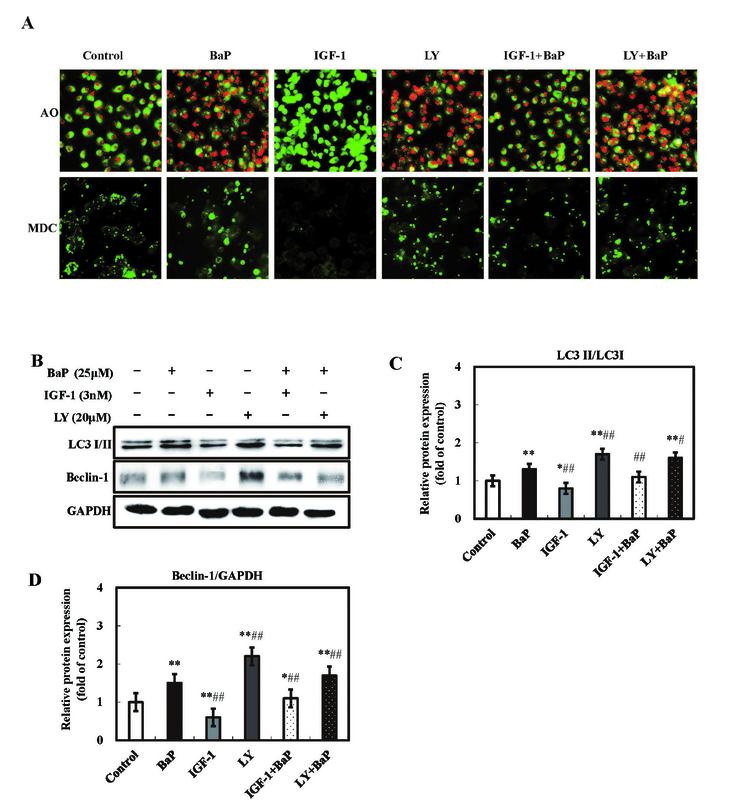 As the key proteins of autophagy, LY294002 improved the over-expression of Beclin-1 and LC3II induced by BaP, and IGF-1 inhibited the induction of BaP on Beclin-1 and LC3II expression (Fig. 4B-D). These results indicated that repression of the PI3K/Akt signaling pathway could promote autophagic death triggered by BaP in HL-7702 cells. FOXO transcription factor family is one of the subfamilies of Forkhead box. Mammals have 4 FOXO genes, FOXO1, FOXO3, FOXO4, and FOXO6. These four genes are related to multiple cellular reactions, such as regulating proliferation, inflammation, aging, and apoptosis (Murtaza et al., 2017). In addition, FOXO factors have a key role in mediating the intracellular clearance via autophagy and the ubiquitin-proteasome system; that is to say, FOXO genes can be regarded as prolongevity factors (Pickford et al., 2018; Masiero et al., 2009). It has been reported that FOXO1 and FOXO3 were able to activate the core autophagy gene through translocating into nucleus, and consequently induce autophagy in cardiomyocytes (Webb and Brunet, 2014). Particularly, FOXO4 gene is abundantly expressed in the heart, and it is known as a tumor inhibitor, involving various forms of cell apoptosis (Yu et al., 2018). As a downstream effector of the PI3K/Akt signaling pathway, FOXO4 is phosphorylated by the PI3K/Akt signaling pathway via upregulating the kinase Akt, and then the transcriptional activity of FOXO4 is decreased. Therefore, it is beneficial to cell survival and growth. It is reported that BCR-ABL fusion gene is an oncogene that exists in chronic myelogenous leukemia; it can stimulate the PI3K/Akt signaling pathway and suppress the transcriptional activity of FOXO3a, and ultimately enhance the proliferation and survival of mouse BCR-ABL-transformed cells (Jagani et al., 2008; Sattler et al., 1996). A recent study showed that long noncoding RNA XR007793 mediates proliferation and migration of vascular smooth muscle cell in Sprague-Dawley rats through repressing miR-23b, and miR-23b inhibitor increases the expression of FOXO4 (Wu et al., 2018). The current study revealed that BaP decreased the phosphorylation of FOXO4, promoted the transcriptional activity of FOXO4 and impacted cell growth negatively through inhibiting the PI3K/Akt signaling pathway (Fig. 5). To sum up, experimental results showed that BaP was able to block the PI3K/Akt signaling pathway in HL-7702 liver cells, and simultaneously induced pyroptotic and autophagic death through inhibiting the PI3K/Akt signaling pathway, ultimately suppressing the proliferation of liver cells (Fig. 6). Pyroptosis is regarded as a newly discovered form of cell death; at present, there is insufficient understanding of the development of its process. The current study suggests that BaP has the toxicity of pyroptosis, but the underlying mechanisms still need to be researched in greater depth. Possible cellular mechanisms involved in BaP-induced pyroptotic and autophagic death in HL-7702 liver cells. In our study, we elicited that BaP was capable of inhibiting the PI3K/Akt signaling pathway and then repressing the phosphorylation of Akt. And, LY294002 is a typical inhibitor of PI3K and IGF-1 is a representative PI3K stimulator. Furthermore, BaP induced two types of programmed cell death, namely, pyroptosis and autophagy. BaP could induce autophagy via increasing the protein expression of LC-3II and Beclin-1, meanwhile, substantial autophagy vacuoles appeared in cells. On the other hand, BaP was able to promote the expression of pro-Caspase-1 and then active Caspase-1. Meanwhlie, BaP can lead to release of inflammatory cytokines and consequently cause pyroptosis. The → indicates activation or induction, ┴ indicates inhibition or blockade. This work was ﬁnancially supported by the Young Scientists Fund of the National Natural Science Foundation of China (31501584), Senior Talent Cultivation Program of Jiangsu University (18JDG023). Ajayi, B.O., Adedara, I.A. and Farombi, E.O. (2016): Benzo(a)pyrene induces oxidative stress, pro-inflammatory cytokines, expression of nuclear factor-kappa B and deregulation of wnt/beta-catenin signaling in colons of BALB/c mice. Food Chem. Toxicol., 95, 42-51. Alharthy, K.M., Albaqami, F.F., Thornton, C., Corrales, J. and Willett, K.L. (2017): Mechanistic Evaluation of Benzo[a]pyrene’s Developmental Toxicities Mediated by Reduced Cyp19a1b Activity. Toxicol. Sci., 155, 135-147. Clements, W.H., Oris, J.T. and Wissing, T.E. (1994): Accumulation and food chain transfer of fluoranthene and benzo[a]pyrene in Chironomus riparius and Lepomis macrochirus. Arch. Environ. Contam. Toxicol., 26, 261-266. Duan, J., Yu, Y., Li, Y., Wang, Y. and Sun, Z. (2016): Inflammatory response and blood hypercoagulable state induced by low level co-exposure with silica nanoparticles and benzo[a]pyrene in zebrafish (Danio rerio) embryos. Chemosphere, 151, 152-162. Hu, C., Yang, J., He, Q., Luo, Y., Chen, Z., Yang, L., Yi, H., Li, H., Xia, H., Ran, D., Yang, Y., Zhang, J., Li, Y. and Wang, H. (2018): CysLTR1 blockage ameliorates liver injury caused by aluminum-overload via PI3K/AKT/mTOR-mediated autophagy activation in vivo and in vitro. Mol. Pharm., 15, 1996-2006. Jagani, Z., Singh, A. and Khosravi-Far, R. (2008): FoxO tumor suppressors and BCR-ABL-induced leukemia: a matter of evasion of apoptosis. Biochim. Biophys. Acta, 1785, 63-84. Kazerouni, N., Sinha, R., Hsu, C.H., Greenberg, A. and Rothman, N. (2001): Analysis of 200 food items for benzo[a]pyrene and estimation of its intake in an epidemiologic study. Food Chem. Toxicol., 39, 423-436. Lewtas, J. (2007): Air pollution combustion emissions: characterization of causative agents and mechanisms associated with cancer, reproductive, and cardiovascular effects. Mutat. Res., 636, 95-133. Liu, D., Xu, J., Qian, G., Hamid, M., Gan, F., Chen, X. and Huang, K. (2018): Selenizing astragalus polysaccharide attenuates PCV2 replication promotion caused by oxidative stress through autophagy inhibition via PI3K/AKT activation. Int. J. Biol. Macromol., 108, 350-359. Mantey, J.A., Rekhadevi, P.V., Diggs, D.L. and Ramesh, A. (2014): Metabolism of benzo(a)pyrene by subcellular fractions of gastrointestinal (GI) tract and liver in Apc(Min) mouse model of colon cancer. Tumour Biol., 35, 4929-4935. Masiero, E., Agatea, L., Mammucari, C., Blaauw, B., Loro, E., Komatsu, M., Metzger, D., Reggiani, C., Schiaffino, S. and Sandri, M. (2009): Autophagy is required to maintain muscle mass. Cell Metab., 10, 507-515. Mohamed, M.Z., Hafez, H.M., Zenhom, N.M. and Mohammed, H.H. (2018): Cilostazol alleviates streptozotocin-induced testicular injury in rats via PI3K/Akt pathway. Life Sci., 198, 136-142. Murtaza, G., Khan, A.K., Rashid, R., Muneer, S., Hasan, S.M. and Chen, J. (2017): FOXO transcriptional factors and long-term living. Oxid. Med. Cell. Longev., 2017, 3494289. Pickford, F., Masliah, E., Britschgi, M., Lucin, K., Narasimhan, R., Jaeger, P.A., Small, S., Spencer, B., Rockenstein, E., Levine, B. and Wyss-Coray, T. (2008): The autophagy-related protein beclin 1 shows reduced expression in early Alzheimer disease and regulates amyloid beta accumulation in mice. J. Clin. Invest., 118, 2190-2199. Rangi, S., Dhatwalia, S.K., Bhardwaj, P., Kumar, M. and Dhawan, D.K. (2018): Evidence of similar protective effects afforded by white tea and its active component ‘EGCG’ on oxidative-stress mediated hepatic dysfunction during benzo(a)pyrene induced toxicity. Food Chem. Toxicol., 116, 281-291. Ribière, C., Peyret, P., Parisot, N., Darcha, C., Déchelotte, P.J., Barnich, N., Peyretaillade, E. and Boucher, D. (2016): Oral exposure to environmental pollutant benzo[a]pyrene impacts the intestinal epithelium and induces gut microbial shifts in murine model. Sci. Rep., 6, 31027. Sattler, M., Salgia, R., Okuda, K., Uemura, N., Durstin, M.A., Pisick, E., Xu, G., Li, J.L., Prasad, K.V. and Griffin, J.D. (1996): The proto-oncogene product p120CBL and the adaptor proteins CRKL and c-CRK link c-ABL, p190BCR/ABL and p210BCR/ABL to the phosphatidylinositol-3′ kinase pathway. Oncogene, 12, 839-846. Shahid, A., Ali, R., Ali, N., Hasan, S.K., Bernwal, P., Afzal, S.M., Vafa, A. and Sultana, S. (2016): Modulatory effects of catechin hydrate against genotoxicity, oxidative stress, inflammation and apoptosis induced by benzo(a)pyrene in mice. Food Chem. Toxicol., 92, 64-74. Shahid, A., Ali, R., Ali, N., Kazim Hasan, S., Barnwal, P., Mohammad Afzal, S., Vafa, A., Sultana, S. and Methana, S. (2017): Methanolic bark extract of Acacia catechu ameliorates benzo(a)pyrene induced lung toxicity by abrogation of oxidative stress, inflammation, and apoptosis in mice. Environ. Toxicol., 32, 1566-1577. Wang, Y., Zhao, H., Shao, Y., Liu, J., Li, J. and Xing, M. (2018): Interplay between elemental imbalance-related PI3K/Akt/mTOR-regulated apoptosis and autophagy in arsenic (III)-induced jejunum toxicity of chicken. Environ. Sci. Pollut. Res. Int., 25, 18662-18672. Webb, A.E. and Brunet, A. (2014): FOXO transcription factors: key regulators of cellular quality control. Trends Biochem. Sci., 39, 159-169. Wu, Y.X., Zhang, S.H., Cui, J. and Liu, F.T. (2018): Long noncoding RNA XP007793 regulates proliferation and migration of vascular smooth muscle cell via suppressing miR-23b. Med. Sci. Monit., 24, 5895-5903. Xiao, T., Luo, J., Wu, Z., Li, F., Zeng, O. and Yang, J. (2016): Effects of hydrogen sulfide on myocardial fibrosis and PI3K/AKT1-regulated autophagy in diabetic rats. Mol. Med. Rep., 13, 1765-1773. Yanagisawa, R., Koike, E., Win-Shwe, T.T., Ichinose, T. and Takano, H. (2016): Low-dose benzo[a]pyrene aggravates allergic airway inflammation in mice. J. Appl. Toxicol., 36, 1496-1504. Yang, C., You, L., Yin, X., Liu, Y., Leng, X., Wang, W., Sai, N. and Ni, J. (2018): Heterophyllin B ameliorates lipopolysaccharide-induced inflammation and oxidative stress in RAW 264.7 macrophages by suppressing the PI3K/Akt pathways. Molecules, 23, 717. Yu, L., Zhang, W., Huang, C., Liang, Q., Bao, H., Gong, Z., Xu, M., Wang, Z., Wen, M. and Cheng, X. (2018): FoxO4 promotes myocardial ischemia-reperfusion injury: the role of oxidative stress-induced apoptosis. Am. J. Transl. Res., 10, 2890-2900. Yuan, L., Liu, J., Deng, H. and Gao, C. (2017): Benzo[a]pyrene Induces Autophagic and Pyroptotic Death Simultaneously in HL-7702 Human Normal Liver Cells. J. Agric. Food Chem., 65, 9763-9773. Zhang, S.Y., Shao, D., Liu, H., Feng, J., Feng, B., Song, X., Zhao, Q., Chu, M., Jiang, C., Huang, W. and Wang, X. (2017): Metabolomics analysis reveals that benzo[a]pyrene, a component of PM2.5, promotes pulmonary injury by modifying lipid metabolism in a phospholipase A2-dependent manner in vivo and in vitro. Redox Biol., 13, 459-469. Zhang, X., Kong, Y., Sun, Y., Qian, Z., Gao, C., Shi, X., Li, S., Piao, Y. and Piao, F. (2018): Bone marrow mesenchymal stem cells conditioned medium protects VSC4.1 cells against 2,5-hexanedione-induced autophagy via NGF-PI3K/Akt/mTOR signaling pathway. Brain Res., 1696, 1-9.